Thai food is a part of the national Thai identity and is a reflection of the Thai lifestyle, culture and way of thinking. Thailand is rich with a variety of crops which allows its cuisine to have a wide variety of dishes suitable for many different palats. 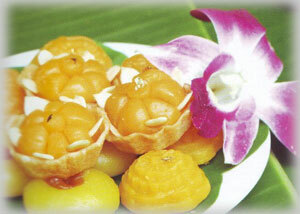 Among the most prominent styles of Thai food is Royal Thai food or Chaowang food. Chaowang food has been internationally praised for its excellence, both in taste and in appearance. Due to its originality, it is cooked within the palaces and presented to persons of royal lineage, the royal family as well as for use in important ceremonies and rituals. Chaowang food differs from what is normally eaten in everyday life in many aspects. e.g. their meticulosity, fineness in every step of selection, preparation and cooking which are very important, no matter that they are simple cooking foods eaten by the common people or special foods cooked by the people working in the royal palace, particularly for Som Tum Chao Wang, will differ widely ranging from the papaya meat that can be seen at a mere glance for the equal sizes of papaya threads, or pieces of soybean cakes, which are the ingredients of Mee Krob, shall be cut into pieces equal to the size of matches sticks. 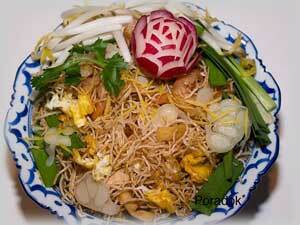 The vermicelli or fine noodles will be cooked into true crispy, not puffy and stiff like other normal vermicelli. Meats including sea-foods used as ingredients in general food cooking must be deboned, and the unwanted parts taken out, and neatly cut into the right sizes before cooking. In the case of Sam Kasat clear soup, the are tied with dry Chinese flowers before cooking. For desserts made by the palace people, the process of preparation is invincible. For example, Sod Sai Chao Wang sweetmeat shall be wrapped within the banana leave with the right size for one mouthful, pinned with small tapered bamboo. Jar Mongkut sweetmeat which consists of small sheets of flour looking like rose petals decorated around the golden crown-like part of sweetmeat, each of them looks very tiny, thin and fragile. For the fruits selected to be put on the food tray, their skins must be peeled off, unseeded before serving, even the sugar apple, all seeds are removed with a sharp knife to maintain the original shape of the foods with minimum bruising. The taste of Chaowang foods must be palatable and mellow, not too hot or less sweet or less salty. For example, in cooking each type of salads, different types of chili are selected. Some salads require baked chili, some require guinea-pepper or goat pepper. Similar to the sour taste, lemon juice, tamarind meat juice or vinegar can be used. Another prominent uniqueness of Chaowang food is the arrangement of food set or food tray which consist of mild tasting food, stir-fry food, mixed salad, deep-fry food with curry that has to go with the supplements like shredded meat or fried Trichopodus fish. There are also sauces like chili sauce, stewed soybean milk eaten with required vegetables, either fresh raw vegetables, boiled vegetables topped with coconut milk or fried vegetables completed in each meal. The palace people in the old days were preparing their foods and planning for each meal on what food should be eaten in the day, including the budget arranged for the cooking expenses which has been succeeded by the later generations in the present time. Besides the taste of the food and the outside looks that must be carved for the beauty, the nutrition is taken into consideration for the Chaowang food as well. For the set of food tray, the consumer shall get all the necessary nutritions. The ingredients in many foods consist of herbs which can be used as medicine such as lemon grass, kaffir lime, mint leaves in various kind of salad, curries and spiced clear soup. Even in many Thai fruit juices, valuable herbs can be found such as roselle juice, screw pine leaves juice, bell tree fruit juice and most of Thai food ingredients consist of mainly vegetables that could help in solving the constipation problem. The Chaowang Thai food is considered as one of Thailand’s symbols and is a cultural heritage that needs to be well preserved as the one that tempered the root of the Thai people that has to be succeeded in the days to come.